It is a bright, safe and comfortable playroom, with a variety of 'learn to walk' toys. 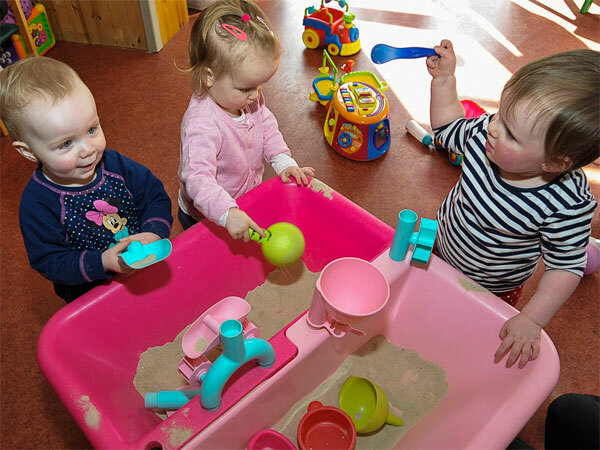 As well as free play and music, the children have the opportunity to play with sand, water and play dough. There are numerous shape sorters, blocks and other relevant activities for stimulation. At this stage of development children are introduced to feeding themselves. We keep a daily record sheet for you to see what your child's needs were each day. The children have lots of books, music/song and stimulating toys. Nursery rhymes, singing and dressing up are also on the agenda. The children are cared for by caring, experienced and trained staff and are allocated a cot in our sleep room and as well as the monitors, staff check the babies every ten minutes while they are sleeping. Your child will be introduced to the next stage of development on a gradual basis.